Have cooktop and downdraft, or stove on site. Check your cooktop/ downdraft combination to be sure it will fit in your cabinet. They rarely fit in the standard 24” cabinet against the wall. Have cooktop and downdraft, or slide in stove on site. Creative Granite. standard procedure for undermount sinks is to have a 1/8" to 1/4" overhang on the bowl, this is called a negative reveal. Deviation from this standard procedure if requested by the customer requires a signed request for custom labor. Aesthetics, hygiene and engineering factors are the reasons for Creative Granite.’ standard negative reveal installation. Creative Granite. can remove your old countertops and dispose of them for an additional cost. Please ask us to include this in your quotation. 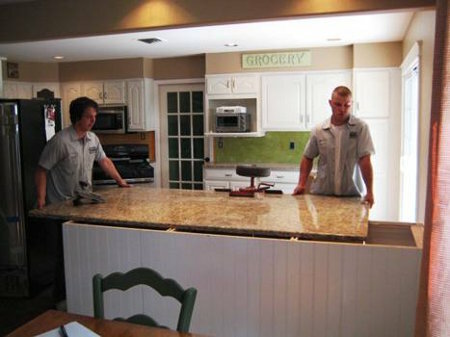 If you purchase removal services of countertops from us, we will remove and haul away your old countertops. We will not tear out remove or dispose of any of the tile backsplash, appliances, cabinets, etc., nor disconnect your gas. 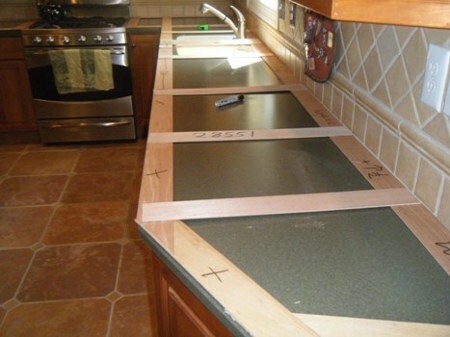 If we are removing your existing countertops, you will need to have the cook top disconnected prior to our arrival. Our service does not include repair or replacement of moldings and trim that are affected by the tear-out or installation of the new countertops. We are not responsible for any gas, plumbing or electrical work required to complete the installation of your new countertops. Although rare, unforeseen conditions can appear as tear-out is completed. You will be notified immediately if any of these are discovered. Creative Granite. does not provide any additional labor needed to repair your cabinets or walls. If you have existing countertops and have not paid Creative Granite. for removal please be sure to have all work completed prior to our arrival for new countertop installation. Dishwasher attachment: Dishwasher must be in place. Most modern dishwashers can be attached to the cabinetry rather than the countertop. Your plumber can take care of that when he hooks up your dishwasher. If the dishwasher must be mounted onto the countertop, Creative Granite will attach it for you provided the dishwasher is permanently installed at the time of countertop installation. Paint touch up - Keep in mind, this is a construction or renovation project and it usually involves moving large and heavy materials within your home - occasionally, although rarely, minor damage may occur to walls. You should be aware of this possibility and prepare to spackle or touch up your paint.